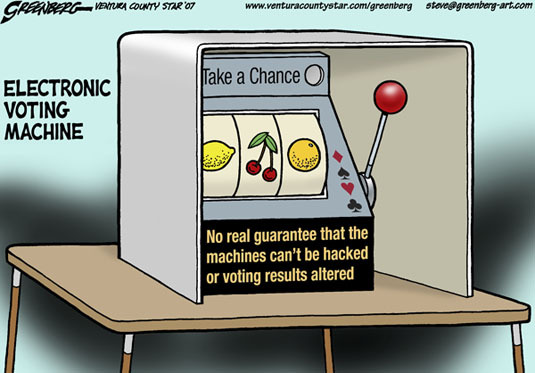 About this cartoon: The Secretary of State of California --and other states' officials too -- have had concerns about electronic voting machines being vulnerable to hackers. If someone had the power to alter the machines' votes, they could conceivably control the outcome of elections... and there is powerful incentive for people to do just that. Besides that, there are potential electronic or mechanical glitches, and a lack of a paper backup to check the votes. It may not be a real problem, but the potential for hacking and altering undermines a key cornerstone of the democratic process.